Viscosities for all standards sold by CANNON are based on the National Institute of Standards and Technology (NIST) value of 1.0016 mPa•s (centipoise) for water at 20°C (68°F). All standards are traceable to the NIST. CANNON has been granted ISO 9002 registration for the manufacture and certification of viscosity standards. Nominal or approximate values are listed in the following tables. Values for viscosity, kinematic viscosity, and density at the temperatures listed below are printed on the label. Viscosity values at other temperatures in the range of 20°C to l00°C (68°F to 212°F) can be supplied for these standards at an additional charge. Unless otherwise noted, viscosity standards are sold in 470 ml (1 pint) bottles. Bulk quantities are available on special order. We invite your inquiries. 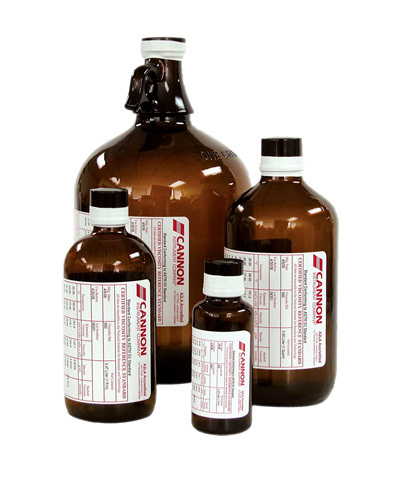 Most CANNON® viscosity standards are hydrocarbon-based. The lower viscosity hydrocarbon standards consist of mineral oil base stocks. The higher viscosity standards (S2000 and above) are polybutenes. For all practical purposes these standards are Newtonian liquids. In Newtonian liquids the ratio of shear stress to rate of shear is constant at constant temperature. Some deviation from true Newtonian response can be expected with the higher viscosity standards, especially when measurements are made at high rates of shear. Frequently the heat developed at high rates of shear can cause the standard to appear non-Newtonian when, in fact, “viscous heating” has occurred. Only hydrocarbon-based standards should be used to calibrate glass capillary viscometers. These standards are furnished in a range of viscosities and temperatures which are of particular interest in asphalt viscosity determinations and the determination of the viscosities of polymers. See ASTM D 2170 and D 2171. See table III for approximate viscosities. Exact values are supplied with each standard. All data are traceable to NIST. 9727-N42 8CL Set of eight CCS viscosity standards containing one pint of each of the following standards: CL14, CL19, CL22, CL25, CL28, CL32, CL48, and CL74. For CANNON Mini-Rotary Viscometer (CMRV) (see ASTM D 3829 and ASTM D 4684). For High-Temperature High-Shear Viscometer measurements at 150°C and 10/6s-1 shear rate. See ASTM D 5481.